Transmission lines transport large amounts of power over long distances across the country. In most countries, electric cables and communication cables are strung overhead. Concerns about the reliability of overhead lines, maintenance cost and operating costs, public safety and quality-of-life are leading more and more utilities and Realizing the power distributors for converting overhead distribution lines to underground lines is the best way to provide good service to their customers. Comparing to overhead lines underground network is more secure and reliable. The uses of underground power transmission are expected to grow in popularity, it is important for electrical engineering students to understand what underground electric transmission cables are, their nature and usage. 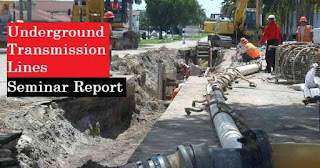 The PDF for seminar reports provided here will give an idea of whether the Underground transmission cables could be an alternative to the more common above ground transmission lines. We have uploaded pdf papers which will help you to understand and draft a nice seminar report. The papers discuss the underground cables, Underground transmission structures, cost considerations, environmental impacts, safety, technical issues, shielding of electric and magnetic fields, post-construction issues. Underground transmission technology is continually evolving. Although we attempt to ensure the information provided in the seminar report is technically accurate, it is subject to change. So, download these papers and study thoroughly to understand the concepts before preparing the final seminar report. The ppt discussed topics such as Types of Underground Electric Transmission Cables, Ancillary Facilities, Construction, and Operation Considerations, Costs Repairs.